In the muggy, suffocating heat of Downtown Los Angeles, the British quartet Minibar has created an oasis. Performing a lunchtime concert at Pershing Square, purportedly for the business people in that metropolitan area, what they seem to have attracted more of is a large number of the homeless contingent. Nevertheless, they seem to be enjoying it, and it's certainly a new audience for Minibar, who have become favorites, at least at the local level, in their adopted hometown. 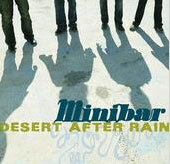 Minibar initially immigrated after playing a show here, which resulted in their getting snatched up by a recording conglomerate and brought over without too much arm-twisting. After their debut album, Road Movies, got buried within that system, the band stayed, recorded Fly Below the Radar and went the independent route, which has proved much better for them. "You feel part of a team. We have total artistic control; we're trying to do the same thing," vocalist and main songwriter Simon Petty says sweating politely post-Pershing Square gig. "A song like ['Road Movies'] was written in England about coming here, imagining what it would be like. But 'New Mexico' [from Fly Below the Radar] is about driving through the American landscape and using that to relate to where we are emotionally." Originally lumped in with British bands with a tendency towards sounding alt-country, Minibar now sound less that way and, bizzarely, more British. "We've used lots more influences on this album," Petty says. "It's much more eclectic. Absolutely no thought went into that, it wasn't deliberate at all. I get to the point where I don't listen to things because it will impinge too much on the style of songwriting. Lyrically, there's a lot of looking back at things in the past. Maybe it's easier to write about places when you're somewhere else. It's roots-rock, but where are your roots?" Living with the other three band members, bassist Sid Jordan, guitarist Tim Walker, and drummer Malcolm Cross in a two-bedroom apartment in Santa Monica, the group shares a car, a mobile phone, and, situated in their front room, a studio. "We bought the whole rig--computer, mics, Pro Tools, pre-amps, everything, for what it cost for four days of recording our first album," Petty points out. "We haven't got enough cash to move out. It's getting really old," admits Petty of their student-like living arrangements. "[But] there are good aspects to it. We get on really well. We live somewhere beautiful. We've all got girlfriends so we're not stuck there all the time. We have part-time work in different fields. Sid and I play covers in pubs. We actually only ever play the same songs, but we pretend, 'Who wants a song?' Someone will say 'T-Rex.' We don't know any T-Rex, and we'll say 'We know 'Starman' by David Bowie.' We aspire to get our own bedrooms one of these days."